I am finding, as I am reading “Christo Fiction”, that so far Laruelle touches upon all the same ideas that I do, yet using different terms than I do. And actually I think the terms I used are much more simple into the point; I do not need a large dictionary in order to discern for people to understand what I’m saying. For example, L uses ‘vectoriellity’ and ‘vector’; I too have used this term in describing the situation. and I like how he says “the quarter turn”, because it really sets in relief how philosophy always wants to subtract, to deconstruct, to pull apart and divide, as Laurel says, to lay everything within the context of a prior decision. The idea of a quarter turn I think is a good illustration. The point is though I think that his should be taken more as a discourse to be verified, and where it is argued against thereby might be a good indicator of a different order, a different orientation upon the object as I say, indeed a different vector of meaning is being placed upon a discourse that is ultimately foreign to that appropriation. As i say the first order must be that of verifying, of placing a description of the matter at hand out for others to see so that others may verify that indeed what is being addressed is the same object. The view that sees such discourse as an argument or a promotion of a set of beliefs should be seen in its proper context, which is in Ls case and my case, a different vector than what is being evidenced with us, and consistent with L, without having to reduce his discourse to some sort of self aggrandization: for indeed the self aggrandizing is in the approach by the real identity. So when we begin to understand what he means by a unilateral duality, we have to also apply the very meaning to the situation that is being apprehended. The question: how is it possible that I know what Lorelle is saying? Do I make an argument for the reason why I know? Do I deny that he’s talking about a fact of the matter ? or do I confirm that indeed he’s talking about the same object that I understand? Of course, Terrence (Blake, at Agent Swarm) has a point, and it is a good point, a valid point, but it is a real point, the point that is made through the appropriation of Ls discourse as an argument or a proposal. So it is indeed that this real valid point does not address the matter at hand in the same vector as concerning L work and indeed my work. We consider such discussions of course, but in the last instance we should see that there is no overcoming what I am calling real faith, there is no convincing one through any sort of discourse that they should be converted to this understanding. This situation of complete discrepancy in meaning that cannot be bridged there by any sort of ‘banking theory’ of education is what I call a partition. The question has got to be, what does it mean that at least me if not many other authors have come upon the same situation that L seems to be talking about? But more, how is it possible that people can disagree about it? What are they disagreeing about? Do not we already have an understanding of the object they seem to be referring to? And what is it that makes me want to refer to what is not the object, which is to say the supposed discourse about this object, to thereforesay that they are incorrect about the object ? In these moments , am I not merely referring to discourse as an object that is segregate or otherwise essentially separate from my appropriation of it in the same move that I am understanding of its meaning? But I think the more significant question is how did I know what L was referring to before I even encountered any of his texts? Which is to say how is it possible that I came/come accross Ls books as a sort of first grade book on the subject that he addresses? How is it possible? With no prior education upon even who L is or was. Without any primer from any other philosophers or considerate material; how is it possible that L reads so simply. I think it’s more that people refuse to believe that a sort of ‘innate intelligence'(if you will) is going on within themselves. And this is the say that they have faith in the potential involved in redundancy to alleviate its condition from itself. I for one do not think that is possible, and therefore call this impossibility, The bare fact of existence, a partition. Below: from “Christo Fiction”, by Francois Laruelle. In a manner of speaking, I sm asking for verification of the results of the experiment. The experiment is not Ls nor my writing. The writings are the results, that are asking for verification from those who have gone through the experiment. Next Philosophy, Colonialism and Partition. Hello Lance, I think that we differ on both questions of terminology and questions of substance (of “object” in your terminology, but I do have much use for this term). On terminology: what you call “partition” I usually call demarcation or bifurcation. I find that you are reasoning in terms of a set of words (truth, fact, object, agreement, science) that you introduce innocently enough but that then crystallise out into some monist situation. In short, you begin by de-banking, and there I am in sympathy, but then you start banking again, banking on yourself, and here you lose me. On more substantial issues, but this distinction is moot, you say that convincing and conversion are impossible. But this is an artefact of your (still structuralist, to my mind) understanding of partition as impermeable. However, experiments here go both ways. People remain fixated, and people are converted, even sometimes by argument. What you call “innate intelligence” Deleuze calls affective and perceptive understanding, which is probably a better name. He said (in his “Letter to a Harsh Critic”) that this was a very good way to understand philosophy “non-philosophically”. 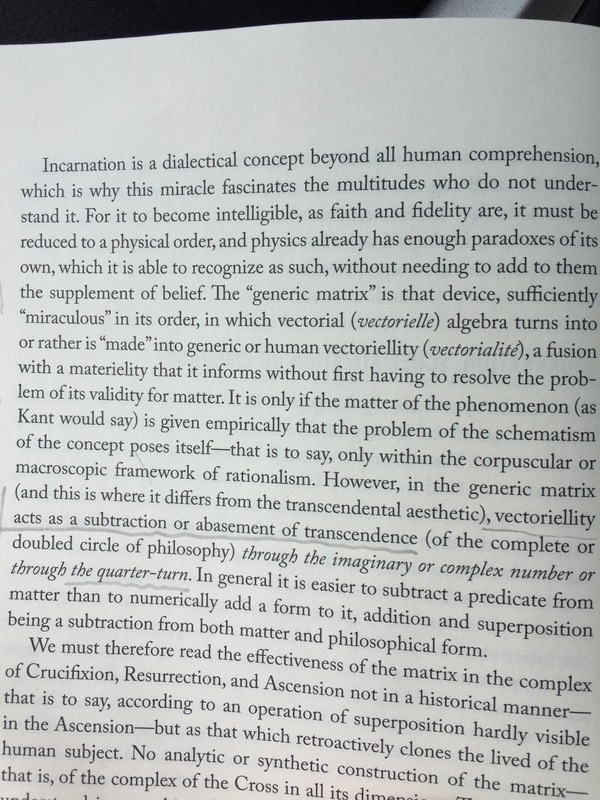 This was his term, long before Laruelle took it up, and Deleuze used it quite generously, unlike Laruelle. But affect and percept are circumstantial and plural rather than insight into unchanging essences. Thanks. I had a feeling that probably D and G and probably Derrida would say much the same thing using their own terms . I haven’t read too much of D and G, because I knew right away that the really talking about the same thing , and I’m not totally sure why but D and G just feels too obvious. Lol. I mean I keep saying that certain authors I read their meaning seems very obvious to me, but TNG to me it’s almost like — don’t give me wrong I’m not even really sure how to voice it — I feel that L actually describes the situation in the most saturated way that discourses able to produce. Whereas D and G writes a theory that when you take the meaning of it it means nothing on one hand, and multitudinous objects on the other. I think the significance of D and G is that they mark the end of a certain kind of philosophical talk , because their discourse actually signifies nothing in the fullest meaning that I can summon up for nothing; like an empty signifier , The multiplicity speaks nothingness , so to speak ; where is ICL his nothingness as actually indicating the situation that is beyond the reach of a certain type or certain way or certain orientation for appropriating meaning from discourse . D and G seem to describe the default of the multitude, what I say is arguing from the multitude by the centrist subject that is already inherent in the multitude. Whereas L seems to me not to default to the multitude side of discourse. He seems to be from the position of the one; and indeed this is what he argues. TNG to me sound like they’re just proving nothing. Where as L is showing not multiplicity but essential duality. This essential duality , hey do I holiday that human consciousness can never overcome , I see is showing a situation that is routine and normal along with what is excluded. I feel that L has something more significant to say, and I could be wrong because like I said I haven’t read a lot of D and G, because L seems to demand the move already having been made, where as D and G describe the move that never needs to be made because it already exists in a potential of a common humanity. You know ; I suppose it’s because I tend to talk about religion rather than politics and ideology. Zizek and D n G like to talk a lot about politics and ideology it appears. I am suspicious of that kind of analysis because it tends to reify that that’s all there is; indeed this could be why I take the tack that I do, because ideology and politics, as these are intricately involved with science , are indeed assumed to be able to count for all there is. Of course I can’t talk about truth with reference to or in the arena of politics and ideology because everyone always takes the arena of politics and ideology as the foundational arena , and that arena is the arena of multiplicity . Yet we should keep in mind my founding statement in what I’m talking about: in order to find truth one must submerge them selves in what is false and indeed speak about it and know it has absolutely true to their bye discover what is false about it. We cannot find what is truth through argumentative postures; One must fully invest being into what is false. Indeed this is what sacrifice is. This is what being selfless means in its most human sense : set aside ones idea of propriety and do in mind of others . And strangely enough this could be said to be how God works, if indeed I god there be. As I have said else where I think with Dave at big story guide; god’s purpose is his own destruction. And as L says, this can’t be merely some conceptual distraction; and indeed has to be a distraction that involves all of history, and it indeed is what Calls for the ideas of intrinsic and. Extrinsic mythology. Indeed; to step outside of politics and ideology necessarily then only concerns with what Is historical , not contingent and not whether or not I should take my dog out for a walk at 10 o’clock or 1030, or whether I should buy that particular fashion of shoes or this one . It’s what I call the long game. I certainly leave leave open The possibility that D and G and other authors Address what I address, and most probably say the same things that I’m saying, i’ll be at in different terms. I admit this in various places. And again that’s why other people are invaluable to me.., as is your input , rebuttal, critique and intelligence. .. I suppose one could say that the clones are politics and ideology on one side and his stork on the other; but then we could enter into a whole discussion about Hagel! Lol. Hey Terence I don’t know if you are linked to the comments of Dave’s truth in actuality posts that he has there, but I’m wondering if you read one of my later ones that I put there where can I outliner kind of project. If you check it out keep in mind that it’s just like a brainstorming. But on .3 I talk about how someone could show the commonalities between various philosophers, how different philosophers use different terms but I really saying the same thing, but then also the differences. Like I suggest that someone could take stock of the continental philosophers and a kind of compare and contrast. And It just dawned on me that you already do that. You are kind of like an encyclopedia of continental philosophers. And you already your blog is comparing and contrasting philosophers. I think it would be a really cool thing if you somehow wrote some sort of book or made some sort of thing that directly compare his philosophers and actually looks at the various terms they use and how they are similar in whatever respect and how they are different and then we could actually see we would actually have a way to view in a kind of comprehensive fashion what we’re really dealing with. And I might say from a kind of selfish standpoint it would allow me to be able to know if what I hypothesize is true is really true. Because it seems to me that so many authors are basically saying the same thing with only marginal differences between them, but that because they use different terms different Clausel structures around which and through which they speak and make argument, no one is able to really say what defines continental philosophy or philosophy in general. Do you see what I’m getting at? ?